Happy Friday! I’ve recently branched out and tried a few new products. Not to mention I’ve been trying to change up my routine and stop using heat on my hair. Let’s just say I’ve been doing a great job at it! I have a new hair routine that completely cuts out any heat product touching my hair and my hair is starting to love me for it. I’ve noticed the biggest change in my hair since I stopped using my straightener and blow dryer. Maybe I’m on the fast track to longer, healthy hair! I wanted to share with you all the lovely products I have been loving, hair, beauty and odd balls! DevaCurl Spray Gel – This product has been a hair saver for me. I normally don’t use gel on my hair but this stuff is amazing. The smell is amazing also! I was researching hair tips for no heat and found that spray gel could help me with curling my hair sans a curling iron. I plan on blogging about how to achieve my hairstyle on a later day so stay tuned! 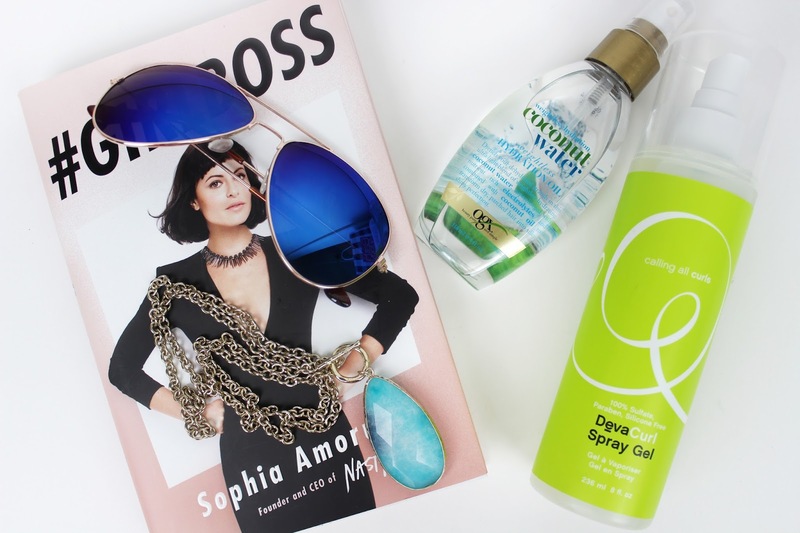 OGX Coconut Water Weightless Hydration Oil – This product! My gosh, I haven’t loved a product as much as I adore this one in a while. I apply a little after I shower on damp hair and a little after I finish my no heat styling. It helps with fly-aways and helping my hair looked hydrated and not dry. A must try for you ladies with damaged hair and no intentions of cutting it. 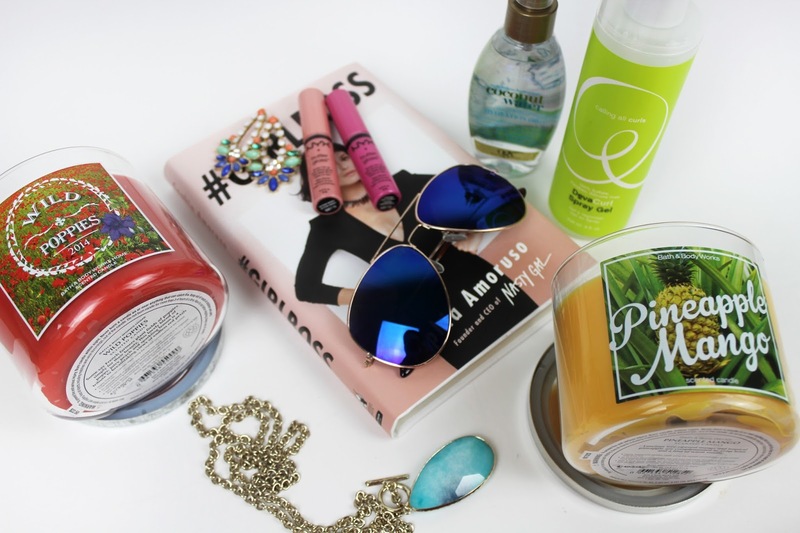 Bath & Body Works 3 Wick Candles – I couldn’t pick just one favorite so I figured I would just state that I love them all! I went a little mad with the semi-annual sale (still going on I believe) and purchased enough candles to last me until the next sale. My favorite picks are Garden Strawberry, Island Margarita, Pineapple Mango, Wild Poppies and Coconut Leaves. All of them are amazing scents, alone or mixed together. I also purchased some Wallflowers to go with my candles and my apartment hasn’t smelled this good in a long time! 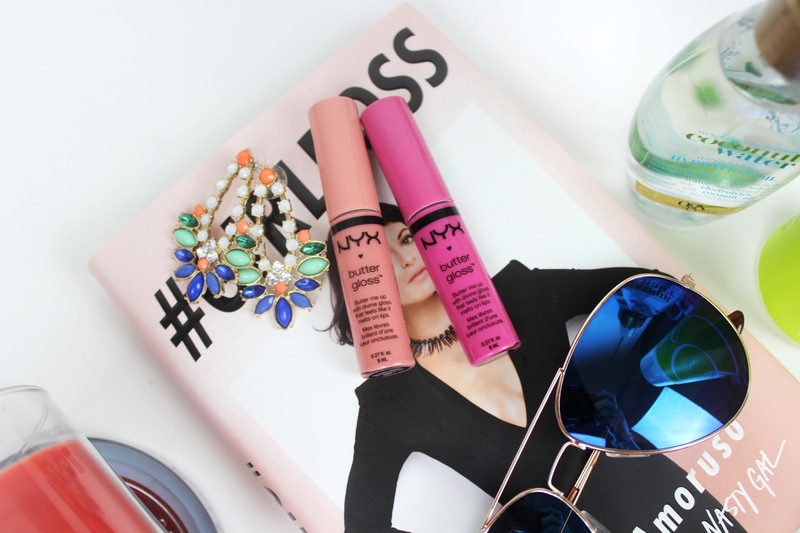 NYX Butter Glosses – These bad boys are my go to lip product for some color or just a bit of shine to finish my look. I absolutely love them, not to mention they’re $4.99 a pop. I have the colors Strawberry Parfait and Creme Brûlée. On another note.. I misplaced my camera remote so I’m sorry I’ve been lacking on the outfit posts! I have a new remote in the mail and cannot wait to share with you guys all my awesome outfits I’ve been swooning over.